In this episode of SHOP Talk, Riley goes in depth on different kinds of targets. He covers ones that you can buy, as well as ones that you can print off the internet for free. One thing that we all must understand is that proper targets lead to proper training. The good thing, is that you can feel free to get creative with your training, and it will still work well. For example, one thing he touches on that is something I used to do, is shoot at 8 inch paper plates as the chest of a target with an index card laid out as the head. When you're tight on money and can pick up a 150 count package of 8 inch paper plates at the dollar store, that's a cheap way to train. I'd use the money saved to buy more ammo. Plus, for someone like me who has a hard time concentrating on just one thing at a time, just seeing the incapacitation zones of the chest and head, and nothing else, were a great way for me to train. Also, for some folks, the different “zones” on a standard target may get a little confusing. Riley touches on this in the video and tells you which zones are the best, but for someone starting out they may just be happy they hit the target at all, even if it does not stop your attacker from advancing. 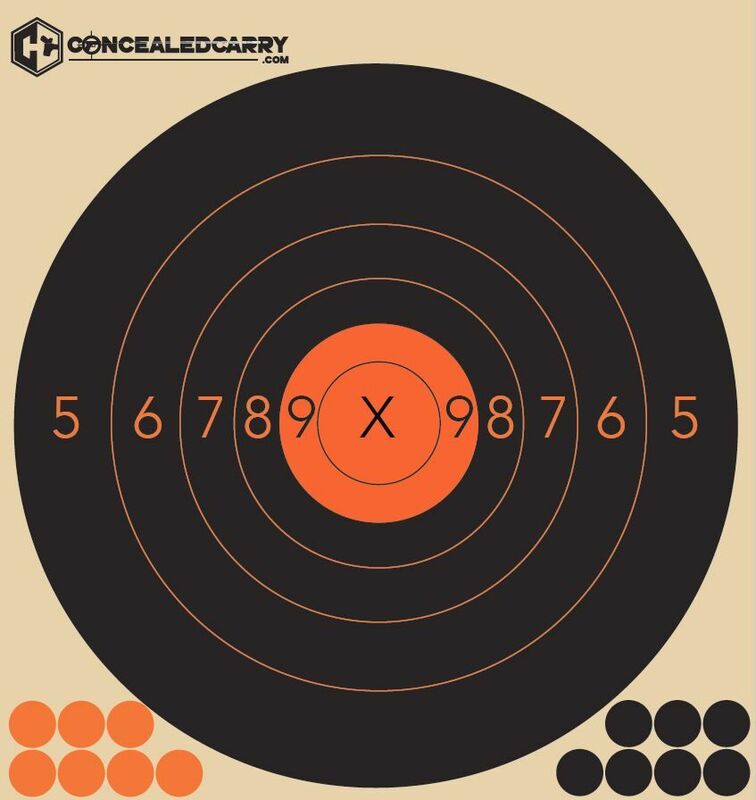 For the rest of this week, ending Sunday at 11:59 Mountain, you can take 18.92% off your purchase of any ConcealedCarry.com branded Adhesive Targets. Why 18.92 percent? Well, that's apparently when the first semi-automatic pistol was invented. So, because of that, we're giving you 18.92% off your purchase of our targets. What's great about these targets is that they stick to the backing very well, and they're reactive. Being reactive is just a fancy way of saying that you can see your hits as they happen. Or after they happen. Because you're technically not supposed to be looking for your hits while you're training. Target1892 is your code to save 18.92 percent off any of the Concealed Carry Branded Adhesive Targets that you can find by pushing on that link. What do you shoot at? Let us know in the comments below.